Howard B. Wigglebottom and the Monkey on His Back is a story just for kids that explains the reasons why people lie, why they shouldn't, and how they can go about making good choices. Howard B. Wigglebottom comes in a series of educational and fun books for young kids. If you are new to Howard B. Wigglebottom books I highly encourage you to check out the website, the We Do Listen Foundation. Not only will you have a chance to see the complete collection of Wigglebottom books, you can also find free printable posters, free lesson plans to go along with the stories, free animated versions of each book, free songs and much more! I just love the wonderful song featured on The We Do Listen Foundation website for this particular book. It's titled "Telling the Truth is Cool" and it has sing along screen lyrics that emphasize the importance of being honest. Listen to it for free here! It's a great follow up after reading this story, which you can get the free animated version online here, or by purchasing your own hardcover copy here. Other great stories in the Howard B. Wigglebottom line include Howard B. Wigglebottom Learns About Sportsmanship, Howard B. Wigglebottom Learns About Bullies, Howard B. Wigglebottom Learns to Listen, and many more! Best of all you can get them on sale for $6.00 each for a limited time, or the whole set of ten for $50.00. 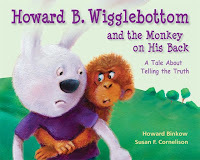 I had the wonderful opportunity to once again review a Howard B. Wigglebottom story, this time particularly Howard B. Wigglebottom and the Monkey on His Back with my seven year old twin girls! The artwork in this book is very colorful and enjoyable. The girls and I both loved soaking in all the pictures as we read along! I won't give away too much, but the story involves Howard lying to his teacher thinking he is protecting his friend. Other events happen along the way, but eventually by the end of the story Howard learns that honesty really is the best policy! I'm a total fan of books that I can read with my kids and discuss afterwards important subjects just like this book contains. In fact, the girls and I had a wonderful discussion about why lying isn't okay after reading this book. I encourage you to check out the great line of Wigglebottom books. They are fantastic! Want To Win Your Own Howard B. Wigglebottom Book? The wonderful folks at the We Do Listen Foundation have offered to give (1) lucky reader of Textbook Mommy their choice of Howard B. Wigglebottom hardcover book! Details: Open to the U.S., 18 years of age and over. One entry per household please. Giveaway ends: March 14, 2012 at Midnight EST. Winner will have 48 hours to respond by email or an alternate winner will be chosen. * Please be honest with your entries. I DO VERIFY! * Disclosure: I was provided a copy of the above mentioned book in exchange for my honest review. All opinions expressed in this review are 100% mine and are not a result of any outside influence. I would choose Horward B. Wigglebottom Learns It's Ok to Back Away. I like Howard B. Wigglebottom learns about bullies. I think I would get the Howard B. Wigglebottom Learns Too Much of a Good Thing is Bad! I would like Learns To Listen. I like The Power of giving A Christmas Story! Thank you! This looks like a great Kids book! "Howard B. Wigglebottom and the Power of Giving: A Christmas Story" would be my choice! I would choose "Howard B. Wigglebottom Learns About Bullies." Learns to listen would be my choice.